I am an optimist. 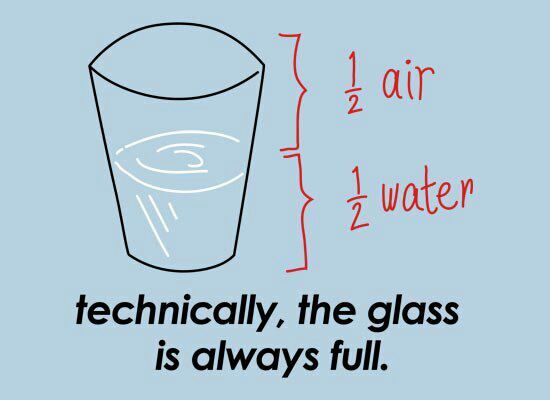 Not a “glass is half full” kind of optimist, but a “glass is always 100% full” optimist (see illustration for an explanation). It’s all in the way you look at the glass. Arlene Goldbard is an optimist too – although she denies it right there on page 33 of her new book The Culture of Possiblity. The basic premise of the book is like the 100% full water glass: if we shift our perception, if we shift the background (culture) to the foreground, a world of possibilities will be open to us. She is asking for a complete paradigm shift – a phrase she uses throughout the book – “a radical revision of a model of reality, changing the meaning of all that we see and do” (p. 173). And why not? For too long, or at least as long as I’ve been following along, arts and culture advocacy arguments have been trafficking in small ideas, ideas about price and economics, rather than big ideas, ideas about the role of arts and culture in improving our basic social existence. The second part of the book is 28 very short essays that serve as an antithesis to the “talking points memo” one often sees on arts advocacy sites encouraging us to tell our legislators about the material impact of the arts for our communities. Instead, Goldbard offers 28 talking points about art’s capacity to increase human potential and social good. In this section she devotes several of the short “chapters” to the concept of “framing,” the topic of the lengthier essay that makes up part three. Along the way, she offers real and specific examples of art affecting social thought, such as the Thousand Kites project, the film Trash Dance, or how viewing Rodin’s The Burghers of Calais helped her to understand the aftermath of the BP disaster. Next time you write to your elected officials about arts funding (and I hope you do so often), check out these “Twenty-Eight Reasons to Pursue the Public Interest in Art.” I would like to think that Arlene won’t mind if you appropriate some of them to further the cause of good policy. The book concludes with a single long-ish essay that pulls together several themes, using metaphor and story. In this section, “Datastan” becomes “Corporation Nation,” a world that “knows the price of everything and the value of nothing” (p. 155, after Wilde). I wish that the Corporation Nation metaphor had been used throughout instead of Datastan, since, as I implied earlier, data itself is not the enemy; it is how data is framed that is. I quibble with a few of her examples. For example, the essay implies at one point that the motives and values of a solar panel manufacturer are somehow on higher ground than those of a petroleum producer, but that is not necessarily the case. Even arts organizations struggle with corporate social responsibility. The value of the concluding essay is in its big ideas and its celebration of beauty and metaphor over profit and numbers. That, too, is the value of the book as a whole. PS. You can read more about The Culture of Possibility and its companion novel, The Wave, on the author’s website. This entry was posted in Arts funding, Arts policy, Culture and democracy and tagged arlene goldbard, arts advocacy, arts policy, Culture and democracy, inequality. Bookmark the permalink. Pingback: Around the horn: Big Brother edition | Createquity. Thanks so much, Linda! Readers of your blog can learn more about The Culture of Possibility and its companion volume at http://tinyurl.com/2newbooksbyAG. If they scroll down on The Culture of Possibility page, they’ll find a link a code for a 20% discount.